Painted and gilded wooden back (probably maple or sycamore), painted pine soundboard. 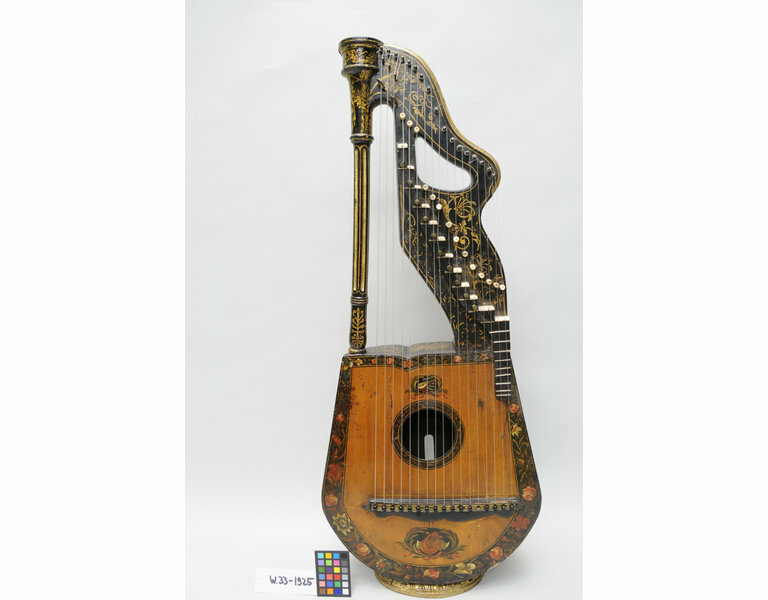 In 1816 Edward Light (c. 1747-c.1832) patented the 'British harp-lute', a combination of both instruments, with a fingerboard which extended the range of the top two strings, and 12 finger-operated stops which raised the strings a semi-tone. He made elegant variants on the harp, guitar and lute fashionable amongst ladies, largely through connections with his pupil, Princess Charlotte (1796-1817), daughter of the Prince Regent, and an enthusiastic player of these instruments. "Similar body to the preceding, but with a base allowing the instrument to stand. [i.e. harp-lute by Edward Light, c. 1810 (Museum no. 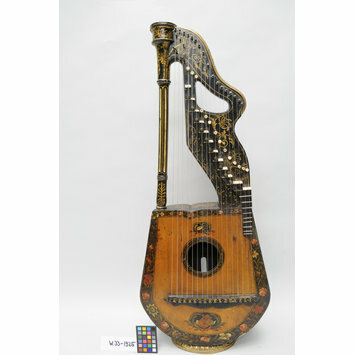 37-1873) and unsigned harp-lute, c. 1815 (Museum no. 252-1882): Both have 'a body of seven ribs, with two sound slots in the centre rib.'] The belly is varnished and decorated with a dark border painted with flowers. Pin bridge and open soundhole. On the capital of the pilar is an angel painted in gold. The harmonic curve is pierced with a kidney-shaped hole, as in the preceding example, and forms with the neck one continuous curved member. The small fingerboard on the body, with nine ivory frets, is for the shortest two strings only, There are two ring stops and ten ditals." Antony Baines, Catalogue of Musical Instruments in the Victoria and Albert Museum - Part II: Non-keyboard instruments (London, 1998), pp. 68-69. Inscribed in gold paint on the flat top of the body of the instrument. This instrument was given to the Museum in 1925 by Miss Edith H. Pilkington. 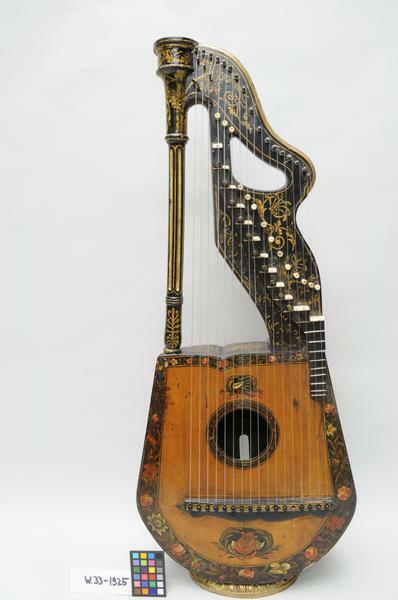 Harp-lute, Edward Light, London, English, c. 1816. Antony Baines: Catalogue of Musical Instruments in the Victoria and Albert Museum - Part II: Non-keyboard instruments. (London, 1998), pp. 68-69.